The Virginia Department of Labor and Industry (DOLI) has updated the mandatory Virginia Job Safety and Health Protection notice with updated information about the application of civil penalties. The notice, which must be posted by every employer covered by the Virginia Occupational Health and Safety (VOSH) law, now states that public sector employers are subject to the civil penalty provisions of the law. Virginia’s occupational safety and health standards are enforced at the state level, although they must provide equal or greater protection than federal standards. State and local governments are covered by the VOSH law and are required to maintain safe and healthy working environments for employees, just like private sector employers. However, until 2018 public employers were exempt from provisions of the law which require employers to pay civil penalties for violations of health and safety standards. According to Virginia DOLI, injury and illness rates for state and local government employees are 60% higher than that of private sector employees in Virginia. In an attempt to curb this high injury rate, lawmakers moved to apply the deterrent structure which private employers operate under to the public sector. The General Assembly passed a law in 2016 requiring the Virginia Health and Safety Codes Board to adopt regulations allowing for the issuance of civil penalties to public employers. VOSH’s civil penalty amounts are adjusted annually. The next penalty increase is scheduled for August 1, 2019. GET THE 2019 Virginia Job Safety and Health Protection Notice NOW! Virginia DOLI has updated the Virginia Job Safety and Health Protection notice to state that public sector employers are subject to the penalty provisions of regulation 16 VAC 25-60-260. The new revision date for the notice is January 2019. 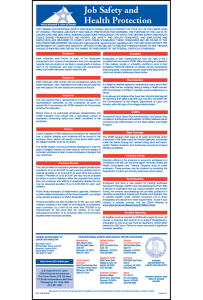 Employers are required to post the current version of the Virginia Job Safety and Health protection notice in a conspicuous place in the workplace where notices to employees are usually posted (16 VAC 25-60-40). 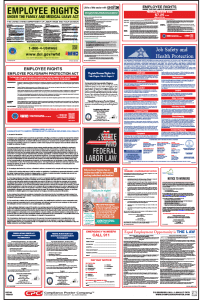 If you already own one of Compliance Poster Company’s signature products, you can update your mandatory Virginia Job Safety and Health Protection notice with the 2019 Virginia Job Safety and Health Protection Peel ‘N Post™ sticker for only $9.95. The cost-effective alternative to poster subscription services, Peel ‘N Post update stickers are quick and easy to use – simply peel off the backing and post the sticker over the outdated notice on your All-On-One Poster or Mobile Poster Pak.